Extra Place — home of dog walkers, skateboarders and Wonder Woman — just received a big ol' jolt of Boulud. Located at 18 Extra Place, just a block away from Boulud's sausage emporium DBGB, the commissary will supply prepped items to all of the chef's restaurants as well as create a space for "great parties," as Boulud puts it. It may also signal the chef's intent to get into the prepared food and retail space. That's the big news here. 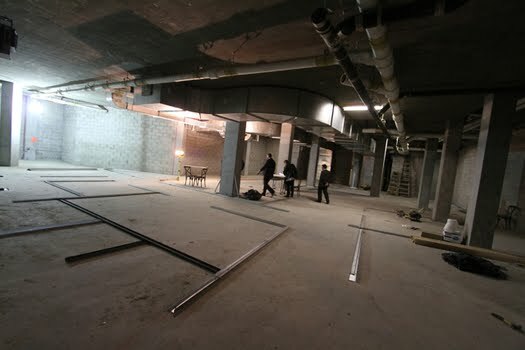 Boulud is building the space to USDA standards, which will pave the way for a cross-country retail business. Currently, bread for all of the restaurants is baked in the catacombs of Daniel, while sausage and charcuterie is produced at Bar Boulud. With the commissary both of those operations will be moved to Extra Place. The plant is scheduled to be online by July, which could put DBGB sausage and Bar Boulud charcuterie in your house in time for Labor Day. Maybe some good news in that the space will be devoted to actually producing stuff. Unfortunately it's stuff that most people really don't need and that people in the neighborhood can't afford. So what else is new in Mayor B's Luxury City. is this the return of manufacturing to lower manhattan? That Daniel Boulud fuckstick makes some good chow and everything but I wish he didn't have to piss on the legacy of CBGB with that stupid "DBGB" moniker. I mean what on earth does high-priced artisanal yuppie food have to do with live punk rock music? Could this be any more incongruous? No! But I guess it's what happens when vanity intersects with cluelessness.